I would like to advertise the abstract submission open for the 4th international meeting on EEW. 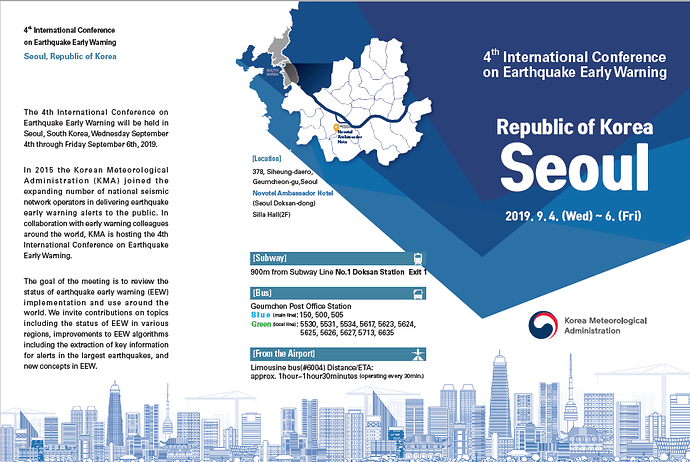 The 4th International Conference on Earthquake Early Warning will be held in Seoul, South Korea, Wednesday September 4th through Friday September 6th, 2019. In 2015 the Korea Meteorological Administration (KMA) joined the expanding number of national seismic network operators in delivering earthquake early warning alerts to the public. 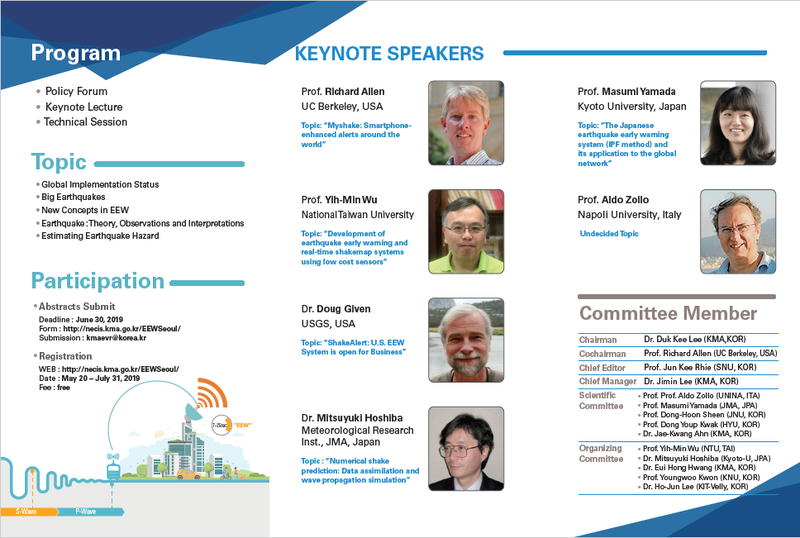 In collaboration with early warning colleagues around the world, KMA is hosting the 4th International Conference on Earthquake Early Warning. The goal of the meeting is to review the status of earthquake early warning (EEW) implementation and use around the world. We invite contributions on topics including the status of EEW in various regions, improvements to EEW algorithms including the extraction of key information for alerts in the largest earthquakes, and new concepts in EEW. Abstracts should be submitted to kmaevr@korea.kr by June 30th. The deadline for abstract submission is June 30th. For more information please contact us (kmaevr@korea.kr) or visit website (http://necis.kma.go.kr/EEWSeoul/).